'A 63-year-old man was made the subject of an interim anti-social behaviour order (ASBO) by Yarmouth magistrates yesterday preventing him from either organising or participating in illegal raves.The joint application against Christopher Farrow, of Hitchin, was made by North Norfolk District Council and Norfolk police.The application came in the wake of a rave that took place at Horsey Gap, owned by the National Trust, over the weekend of May 5-7 involving about 1,000 people'. 'Rampaging partygoers at an illegal rave are being hunted by cops after a police car was “trashed” on an aristocrat's land. The car was attacked on land owned by Conservative peer Lord Marlesford, weeks after the 75-year-old asked Home Office ministers a parliamentary question about policy on policing raves. Around 500 revellers are thought to have gathered on a former airfield at the weekend. Police say no officers were hurt as a result of the attack on the car at Parham, Suffolk, early on Sunday'. 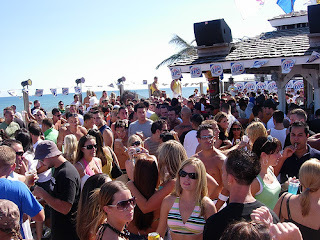 'East Quogue’s Neptune Beach Club, located on Dune Road, found itself in a drug scandal involving 15 individuals this past weekend. Southampton Town Police Street Crime Unit reports that of the fifteen arrested, six were from various towns on Long Island. At the popular nightclub, an undercover police officer bought Ecstasy twice from three different people and arrested the three on felony charges on Monday. The other twelve allegedly possessed and/or ingested Ecstasy; cocaine; Vicodin; ketamine; GHB; anabolic steroids; marijuana; Percocet; drug scales; and packaging materials in the Tiana Beach parking lot... People other than the fifteen were arrested for urinating and consuming alcohol in public as well as littering'.